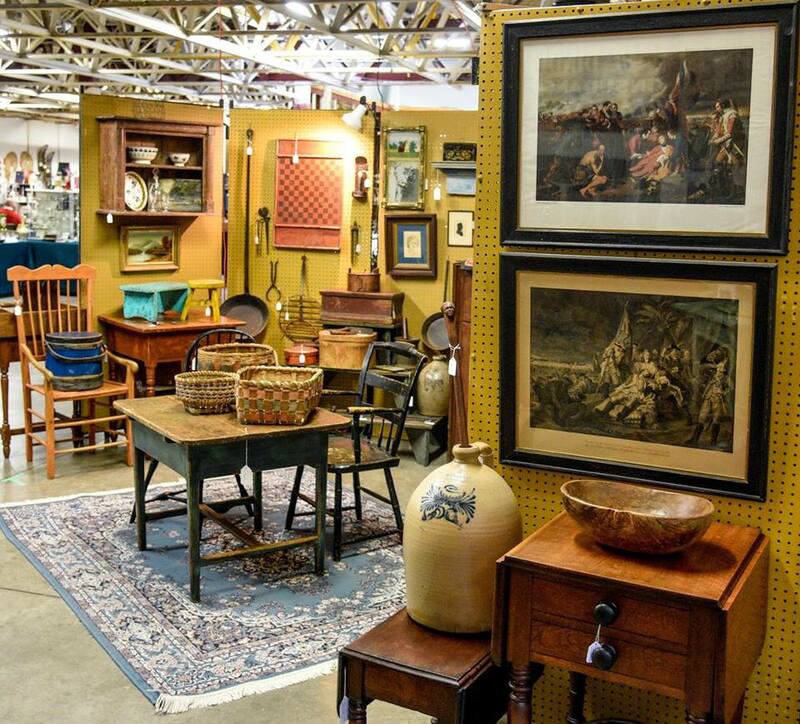 As I write this the approximately 40 dealers who will be participating in the Kingston Winter Antique show or “Cabin Fever” as it is known, will be waiting patiently in line for their turn to enter the big loading doors and unload their truck inside. Only two or three dealers can enter at a time and you are expected to unload as quickly as possible and exit to let the next person have their turn. There are four or five strong, willing helpers provided which definitely speeds things up, not to mention lessening the wear and tear on the dealers. 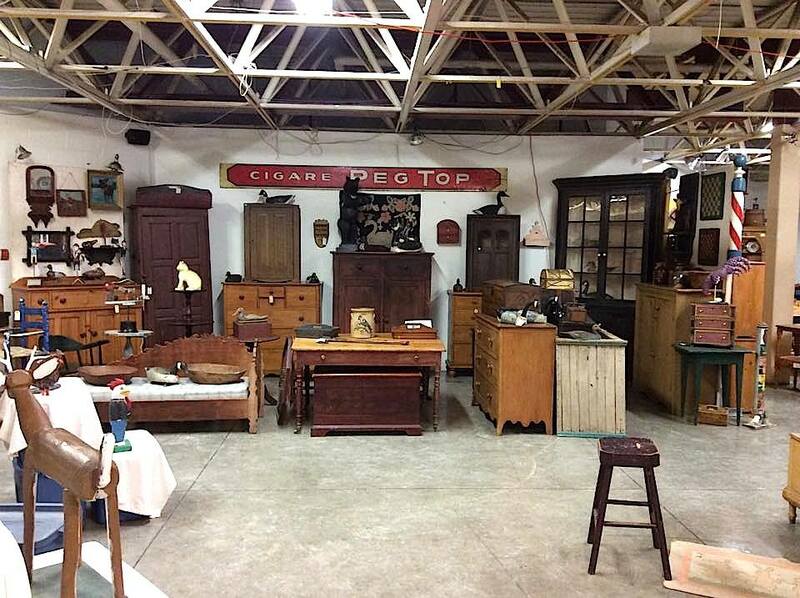 Cabin Fever is the first important Canadian antique show of the season, being held early in February, and it is always filled with top quality dealers and items. 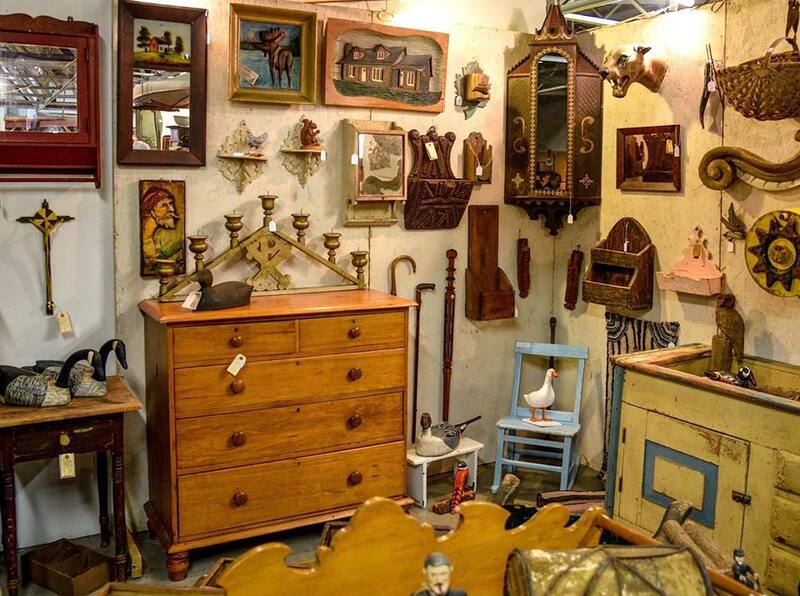 Many dealers showing here do only a couple of shows a year, with the Bowmanville Spring Antique show being the other big show for “serious” collectors of Canadiana and folk art. 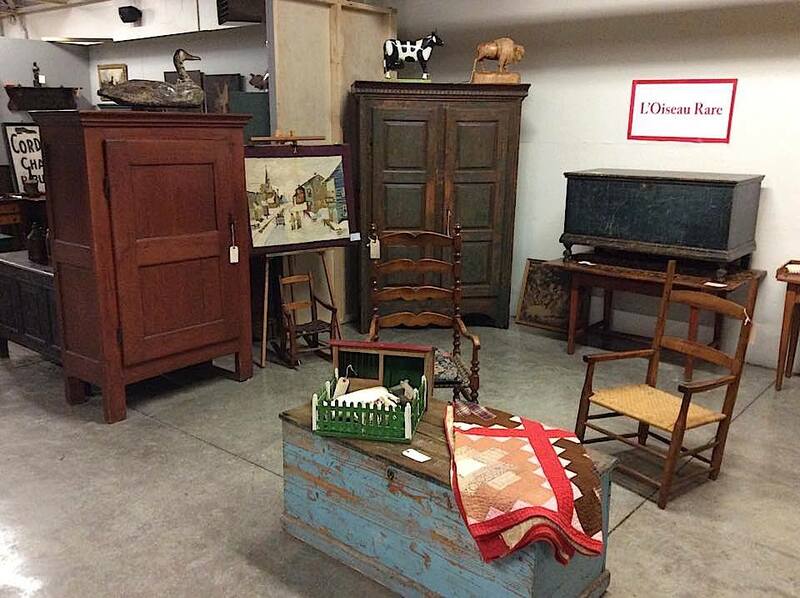 Kingston, and Eastern Ontario in general have traditionally been the home to many of the most serious collectors of early Canadian country furnishings so the dealers work hard to offer their best. People really look forward to this show. They line up hours before the 10 a.m. opening to be certain that they will be first through the doors, and directly on to their favorite dealers. Many of the best items are sold within an hour of opening. When we were doing shows, Cabin Fever was our favorite. It’s run by some very nice folks who make it their business to take care of everyone’s needs. Your rent includes two nights at the nearby Fireside Inn, and coupons for free breakfasts and Saturday night dinner. Because everyone stays at the same place they cut a deal, and pass it on making it quite reasonable for the individual dealer. The promoters do a good job bringing the dealers and collectors together. They offer a good rate on rooms for collectors, and throw a big party on Friday night. Everybody relaxes, has a drink and snack and mixes it up. You overhear conversations like “what did you bring me that’s really special”, and “ did you happen to bring any redware” etc. The savvy collectors are lining up their plan of attack for those first vital minutes. Some arrangements to put things aside are being subtly worked out. It’s all part of the game. It’s funny what you look forward to. One of the great pleasures of doing this show for me was the coffee room. During set up they always present a tray of the biggest, gooiest cinnamon buns you’ve ever seen, made by a local bakery. They are delicious and are sure to raise your sugar levels high enough to provide plenty of energy for all that unloading and unpacking. That and a good strong cup of coffee and you are away to the races. The coffee room remains open throughout the show and is the place everyone likes to come to hang out and tell stories. In the old days it was also the smoking room. It got so smokey in there it was ridiculous, and the nonsmokers eventually forced the organizers to see reason and kick them out. First to a dinky little closet near the furnace room, and eventually right out of the building. The smoke was hard to take, but the stories being told by the old-timers in those days while they enjoyed their smoke and coffee was almost worth the potential lung cancer. Talk about your picker’s stories. Once these guys got started it didn’t stop. Then when everyone gets set up and you are back at the Inn, everyone goes for a cocktail and again the stories begin to flow. Maybe it is the actual cabin fever effect of the season, but people do seem awfully glad to be getting together, and shooting the crap, as it were. The set up on Friday can see a lot of dealer business. You notice a lot of items moving from booth to booth. Deals can continue to be made well in to the night. Saturday morning, 10 am. The flood gates open, and you are run off your feet for the next couple of hours while the keeners swoop through and make their selections. At a show of this caliber, the first three hours can either make it, or break it. Sure, you can have a good sale anytime right up to the last minute, but your odds are greatest with this first wave. It can be very exciting or quite frustrating. People hardly slow down to look. You can stand there quite a while answering questions and greeting your regular customers before someone breaks the ice and buys something. You can also sell five or six things in rapid succession right off the bat, and then sell nothing for a long time. While people continue to move in and out of your booth you do your best to stay engaged and make the sale where possible. By the time you are sending somebody out for lunch sandwiches about 1 pm you’ve got a pretty good idea of how your show is going to shape up. That being said, it usually worked out well for us and we felt pretty comfortable early on. It’s a whole other crowd in the afternoon. More of a general crowd like you would encounter at any outdoor or mall show. There’s typically a lull in the middle of the afternoon, and then sometimes a bit of action towards closing. People coming back for something they had looked at earlier, for the most part. “We’ll think about it over lunch”. Ya right, but then once in a while they do come back. Win or lose, by the tie five o’clock rolls around you are ready to head back to the Inn and put your feet up. Then you’ve got a little bit of time, or a lot of time to relax and enjoy a beverage before dinner, either at 7 or 9 pm. Being basic, farmer types we always went for the 7 pm dinner so we could be in bed sooner. The real fun people all went to the 9 pm sitting. We would hear about it at breakfast the next morning. Reports on all the fun and festivities which often included the throwing of buns. Too much fun for yours truly. I remember one year when our friends David and Mary Jo Field introduced me to the joy which is the martini. I liked it so much I had another and then had to go to bed, missing even the 7 o’clock dinner. Sunday is a good day to really look over the show, and get caught up on news and rumors with the other dealers. Somebody is typically designated to go and fetch a wonderful lunch from a downtown bakery and café called Pan Chancho. Whoever has the biggest harvest table will host and we would enjoy the spread while everyone kept an eye on each other’s booth. By 2 p.m. you are anticipating the 4 o’clock finish, and starting to pack up in your mind. By 3:30 everyone is getting their boxes ready, and getting their trucks in the line up to be brought in as soon as the show closes. Everyone waits until closing time and then swings into action. Some who have no large furniture will park beside the door instead of waiting to come in, and will bring everything to the truck. This was my routine the last several years of doing the show. For the most part it was o.k. but I remember a few years when it was -20, and your hands are just burning as you stand out there in the blinding snow trying to tie down your load. Facing a five hour drive home, and that is on a good night. 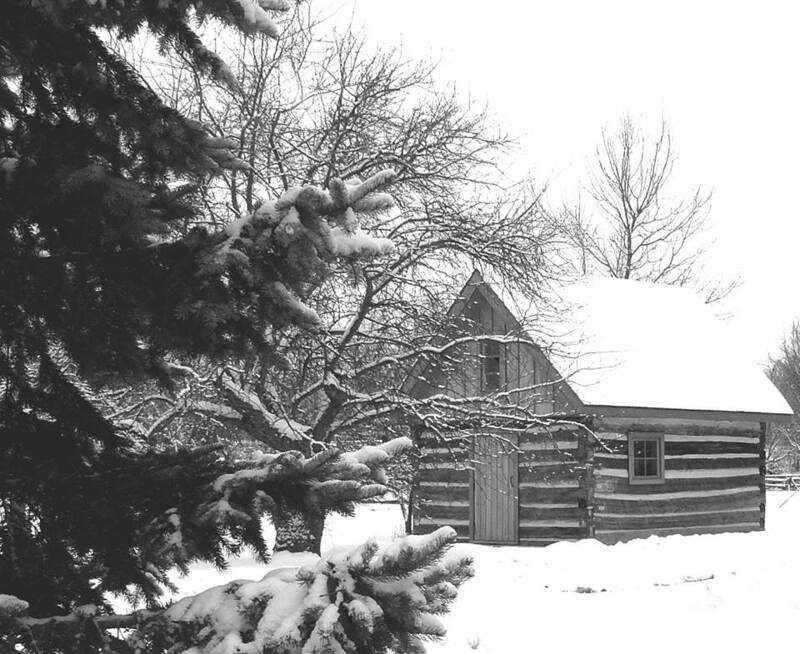 If you drive through a snow storm, it can take a lot longer. Mind you, if you are coming off a good show you are feeling great anyway, so you can take that positive energy, tune in a good station on the radio, and just head towards home. 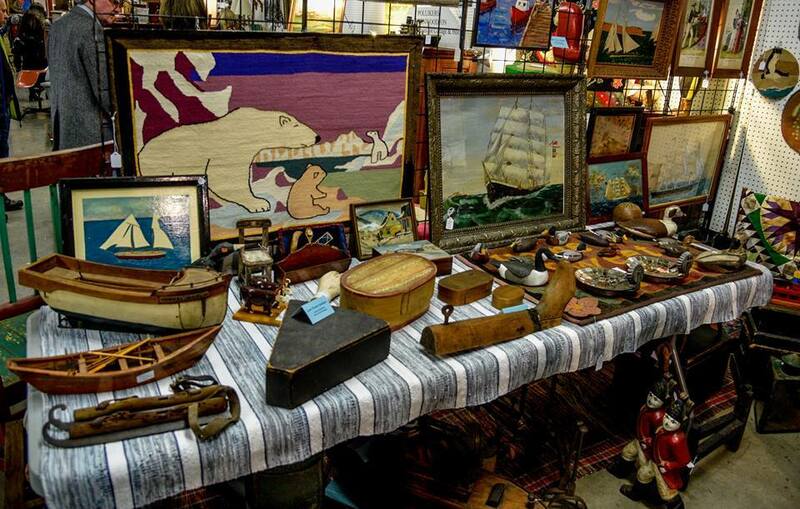 This entry was posted in Attending antique shows and tagged antique shows, Bowmanville, buying antiques, Cabin Fever, Canadian Antiques, Kingston, Kingston winter antique show, top show, vintage by shadflyguy. Bookmark the permalink.